The Moto 360 smartwatch from Motorola is likely to ship next month, with the company having just sent out emails requesting shipping information from I/O attendees. As ever with Google’s major developers’ gathering, there was plenty of free stuff on hand for those who turned up, and with most having opted for the endearing aesthetics of Motorola’s first ever smartwatch in the pick-and-mix of gadgets offered, we may now have a decent idea as to when it will roll out to consumers. 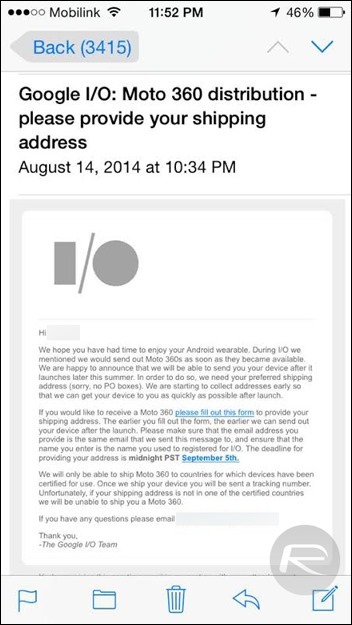 In the email to attendees, the deadline for replying with the necessary shipping information is stated as September 5th at midnight Pacific Time, and although this doesn’t necessarily guarantee that the device will be available from that day onwards, the fact that Motorola just announced a press event for September 4th is a bit of a give-away. Reading between the lines, it would seem as though Motorola plans to deliver one last pitch of the Moto 360 in Chicago on the 4th, with either immediate availability or shipping from the following day. The event, which will also see the Moto X 2, Moto G 2 unveiled along with an interesting, headset-like device, will be preceded by the Galaxy Note 4’s Samsung Unpacked showcasing on September 3rd, and given how many smartwatches the Korean outfit has unleashed since the Galaxy Gear dropped alongside last year’s Note 3, don’t be surprised if an attempt to upstage Motorola and the Moto 360 is made all the way from Berlin. 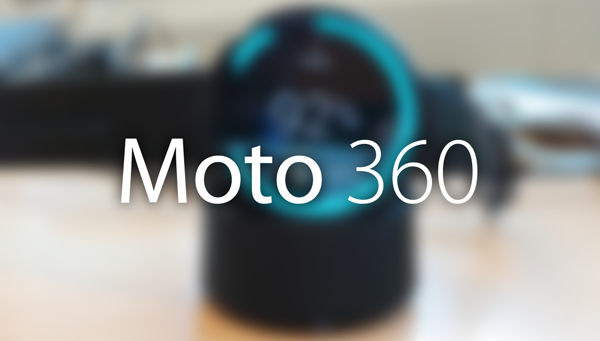 Despite being initially wooed by the traditional charm and solid build of the Moto 360, it has shown itself to be just as capable as those competing, and although some skeptics doubted whether a circular display would make practical sense on such a small device, it’s clear that users will still be able to get the most out of Android Wear through the rounded panel. So, folks, it does seem like the Moto 360 will begin shipping from September 5th, but with a good few weeks to go until Motorola’s special gathering, we’re not going to get too carried away just yet. After all, it has yet to be marked as an official launch date, and given the unforeseen delays that often beset new gadgets late on, we keenly await a definitive date from Motorola.